I had a sudden craving for fish n' chips. 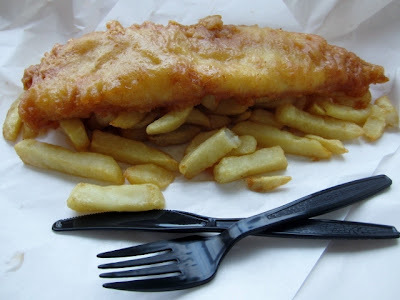 So I googled "fish n' chips in Singapore". In amongst the suggestions I came across a post from a very popular and famous blog here in Singapore, Ieat.Ishoot.Ipost. It is well worth looking at if you're wanting to try new dishes, or to find your favourite. They also have have an app for smartphones, which is very useful. So we hopped on a bus, and headed towards Tanjong Katong Road to where Smiths is located. We arrived around 7.30pm, and already the small, cozy restaurant was half full. We ordered Cod & Chips x2 (S$36), Mushy Peas - in an 8 ounce cup (S$2.50), Curry Sauce - in an 8 ounce cup (S$2.50) and two cans of Coke (S$4), a grand total of S$45.00. It is a little on the expensive side, but the food was good so it softened the pain a little. Smiths have three locations, Tanjong Katong Road, Balmoral Plaza and Boat Quay, more details are on their website. We live just up the road from the Tanjong Katong branch so go there quite a lot when the craving for fish and chips takes over us. Great post Pam! I told Sean and he immediately wanted to go, he misses his mushy peas and curry sauce! So off we went and he said it felt like he was back in England, very authentic. I still prefer Aussie crumbed fish and chips with chicken salt better, so let me know if you find one of them!